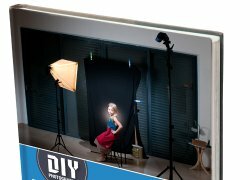 It was just a week ago that we launched our first eBook: – Home Studio Photography: Your Complete Guide To Building A Photography Studio At Home. It’s been great seeing the strong connection with DIYP readers and the hundreds of books downloaded and of their ways to help someone build a softbox from macaroni and pastrami PVC and wood. Today is the last day of our launch week promotion where the book sells for $14.95. starting tomorrow the book will sell for $19.85 – still a heck of a deal, just not as good as $14.95. We got lots of mail saying that “that’s a d–n fine book”. We also got some mails with questions about the book. the ones that were frequent got into the Frequently page thing. (The FAQ page also features a hot video of the book on an iPad). You know you want the book – Get It Here.